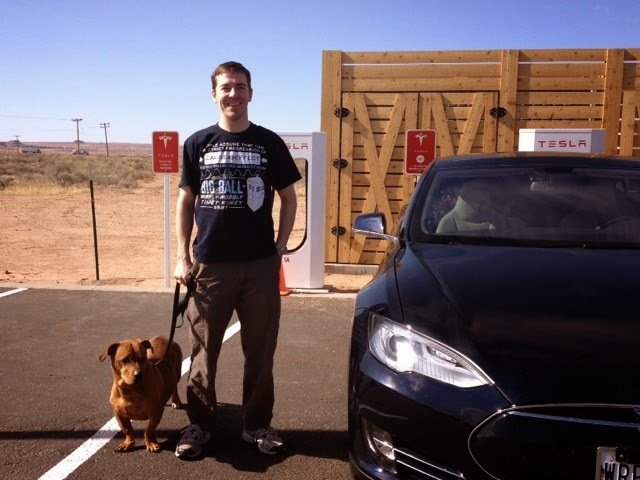 Moving across the country in a Tesla Model S, to start a job at Tesla Motors! 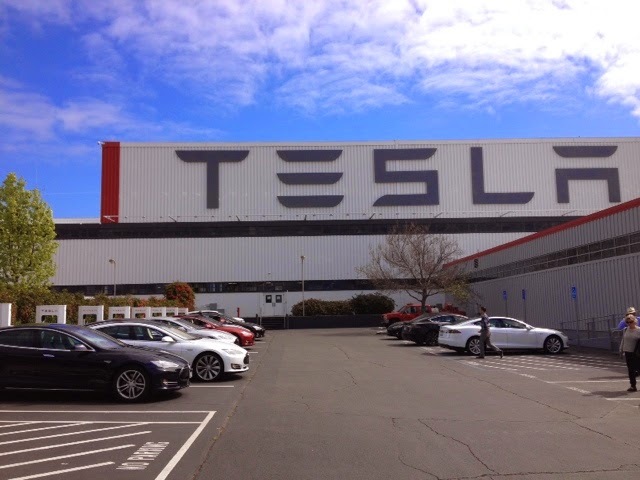 Today we had to drive to East Bay to pick up some things from the moving company, so we stopped at the Tesla factory in Fremont to use the supercharger. This is where Warp Drive was born! 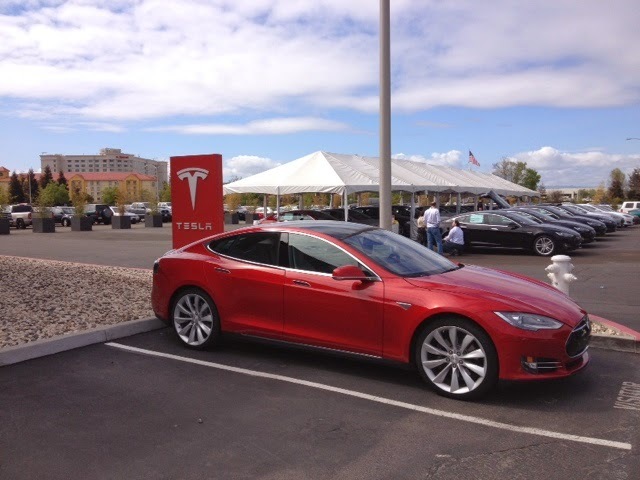 There are dozens of Model S's here. It is amazing! We did it. Warp Drive has seen the 101, the 280, and El Camino Real for the first time! We have about 1000 (literally) more pictures of the trip, as well as some statistics and more thoughts on EV driving and Tesla to come, so keep checking back on this blog for the next few days to see more as we get settled in Silicon Valley. We also plan to keep posting more pics of Gambol, Warp Drive, and Chris & Shannon's adventures, so check back frequently! 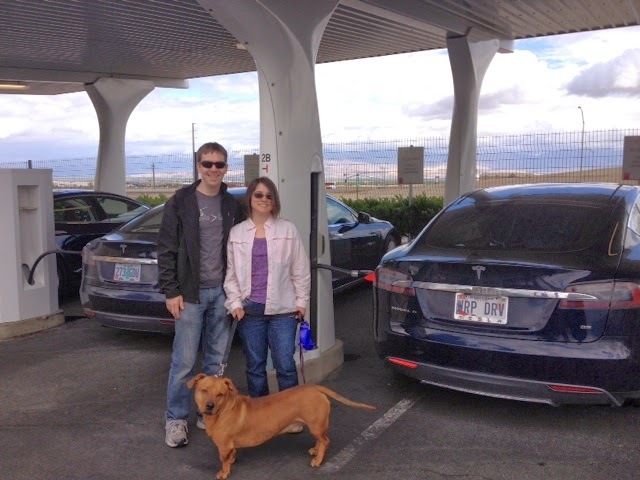 Special thanks to Matt, Hart, Teresa, Deb, Sam, Dennis, and all the other Model S owners and Tesla enthusiasts that we met along the way. Thanks for reading and sharing our trip with us. Good night from San Francisco Bay! 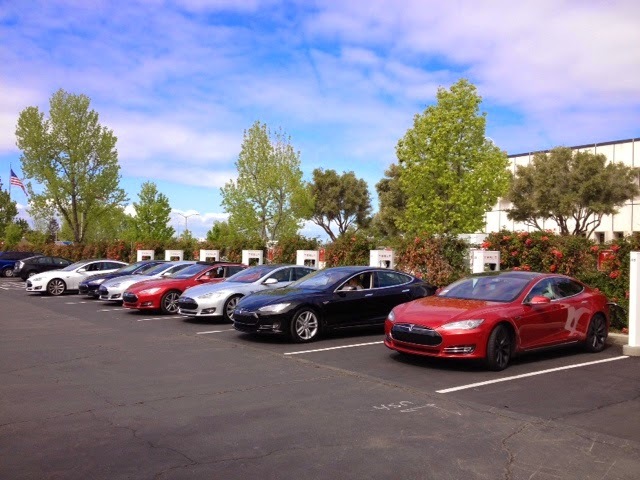 We are at our 30th and final supercharger in Gilroy, CA. 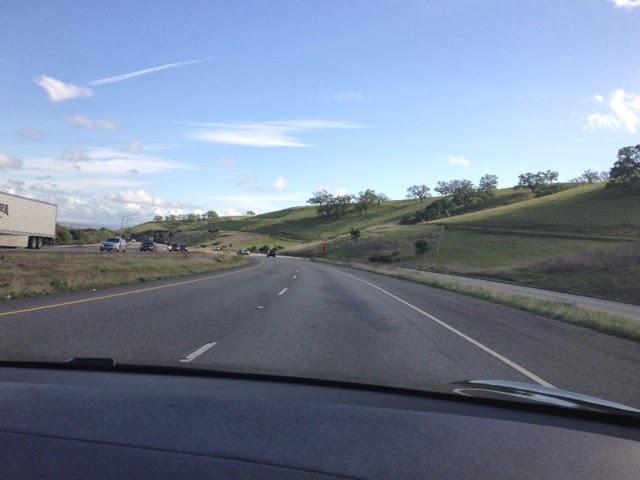 On the way here, you drive past a beautiful lush landscape by the San Luis Reservoir. 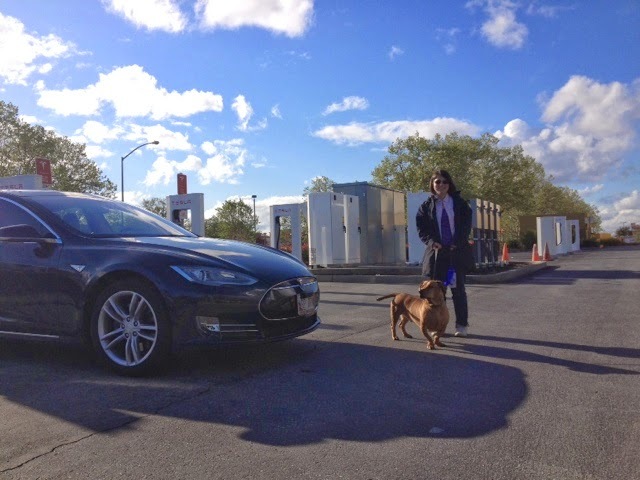 Gilroy has 10 charging stalls as well as other public charging stations. 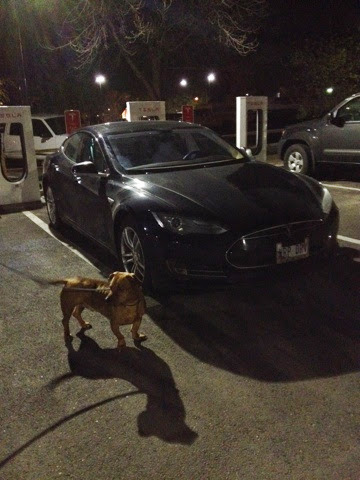 We ran into another Model S owner, from the east coast! Superchargers have turned out to be a fun place to meet new people, exchange Tesla tips and stories, and learn about cool new places to visit. Now we're off to our final destination! 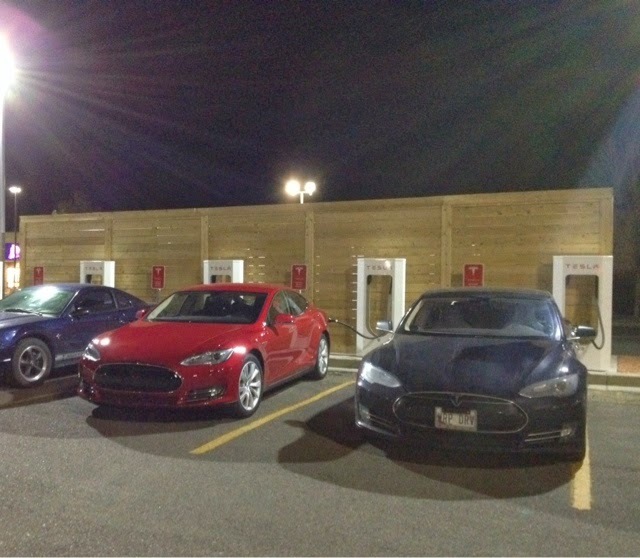 Hung out at the Tejon Ranch supercharger with 3 other Model S's! This is the first charger we've seen with a solar canopy. 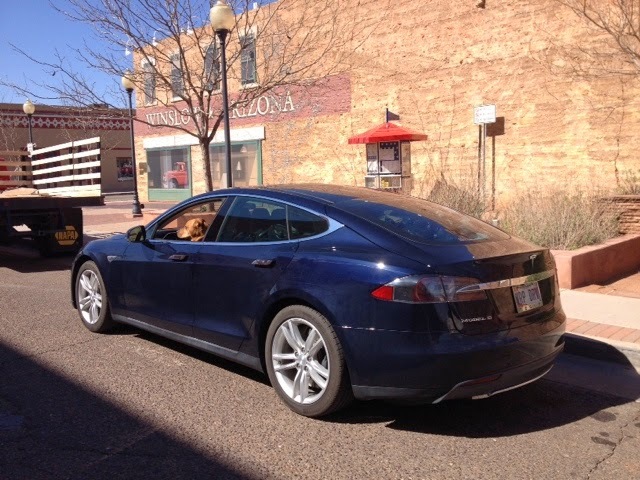 Blue is the popular Model S color of the day. 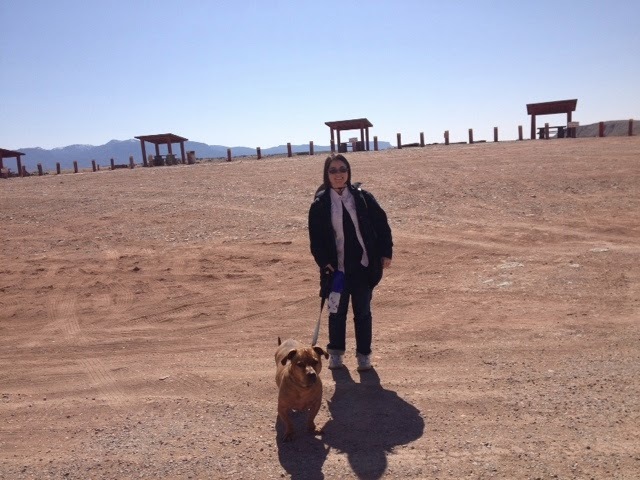 We decided not to go to Vegas - too complicated with a dog, and no time to see things. 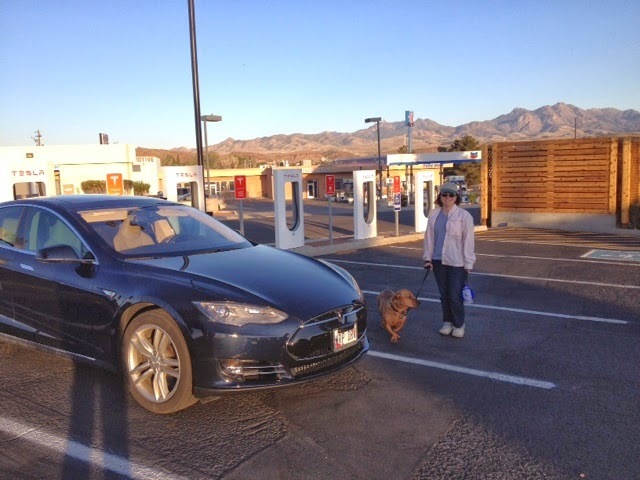 Instead, we got to try one of the longest supercharger routes - Kingman, AZ to Barstow, CA, about 210 miles. 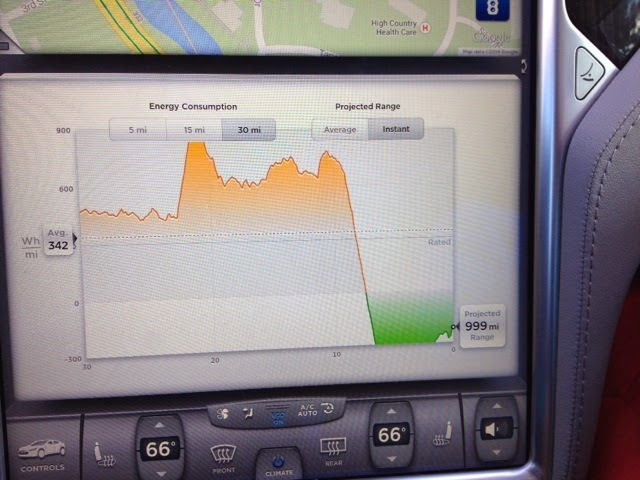 In a strong headwind, this can be tricky in a Model S, but we made it easily with plenty of miles to spare. 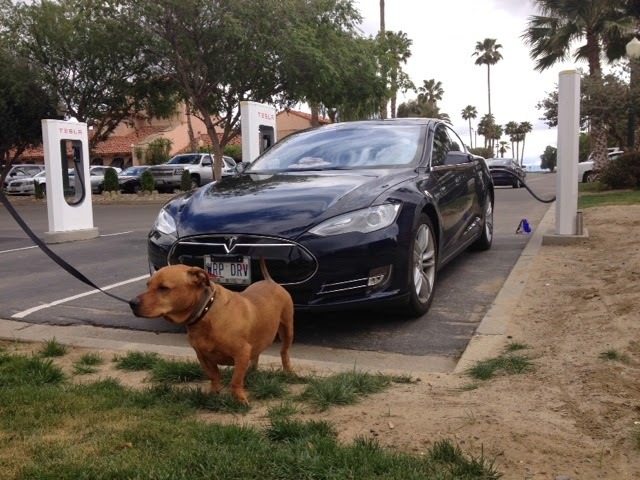 The Country Inn at the Barstow supercharger is dog-friendly and has an amazing breakfast. Today is our last day! 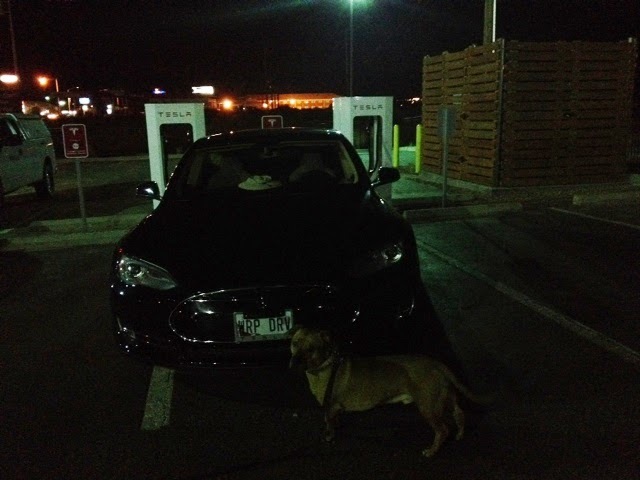 We hit Tejon Ranch in Lebec, CA, then Harris Ranch in Coalinga, CA, then Gilroy, CA, and finally Palo Alto! We should be there around 6pm if all goes well, but there's a major wind advisory in our area so who knows what will happen? Tesla or bust! Made it to Kingman, AZ in record time. Here's the beautiful view from the supercharger. I'll leave it as a surprise where we go next. 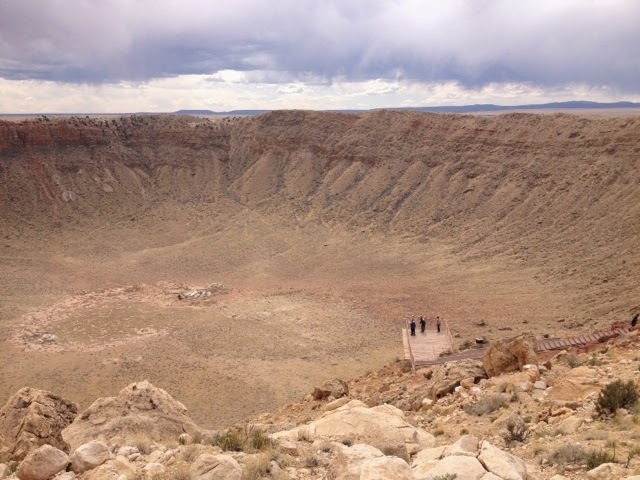 We've been excited about Meteor Crater ever since we started planning the trip. It did not disappoint. It is enormous. Over 500 ft deep! You could fit 20 football fields in the bottom. If you come here, bring a wide, wide angle lens. They don't allow dogs inside, so we had to take turns visiting. There is so much to see that we were each inside for almost an hour. Even with 2 hours sitting in the parking lot with the a/c on, we only used 5 miles of range. 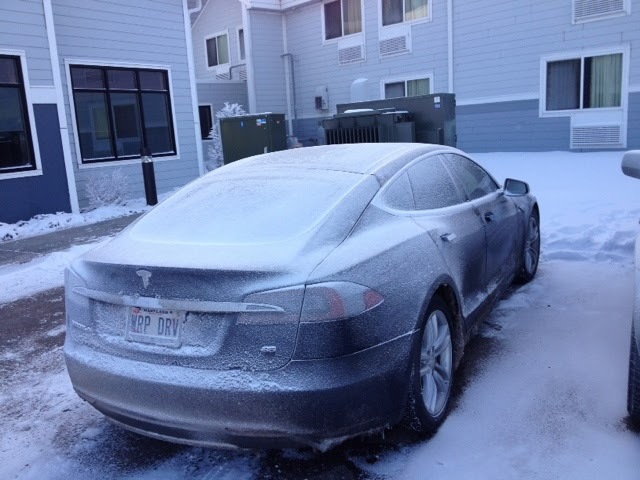 The Tesla a/c is really efficient. 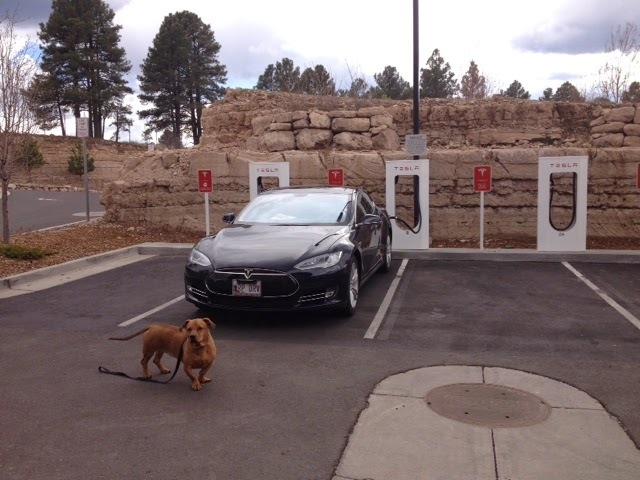 Stopping for a quick charge in Flagstaff, AZ. Later we'll have to decide whether to hit Vegas (baby) or not. Just for Jordan from a comment on an earlier post, we made sure to get Warp Drive fully in a legal parking spot. Good luck on your own driving test, Jordan! Our first stop of the day is in Holbrook, AZ. If we were here just a few weeks ago, we wouldn't have to change our clocks, because our start and end would both be in Mountain Standard Time. 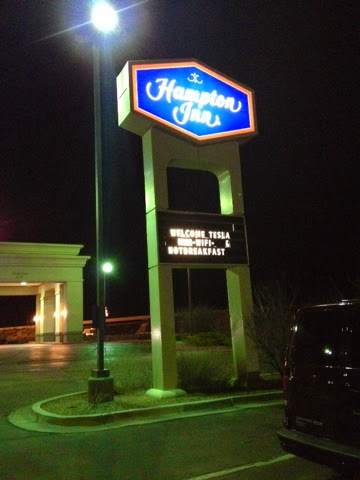 However, since it's now Daylight Savings Time, our hotel was in MDT and Clever Arizona is still in MST. When we cross into PDT there will be no time change. Did you follow all that? I saved this shirt for this event. Because I'm a geek like that. Wibbly wobbly timey wimey. We're finishing day 6 in Gallup, NM. Here's our total road trip so far on Trip A. Only 1000 miles to Palo Alto! We are staying on historic Route 66 tonight. Here's Gambol before retiring. Ship Rock is the main attraction on the drive from Blanding, UT to Farmington, NM. It is far more massive than I imagined. Unfortunately for you, reader, the photos are on the real camera and not our mobile phone, so we can't post them till tonight. Now that we're in New Mexico, there are a somewhat improbable number of car washes. 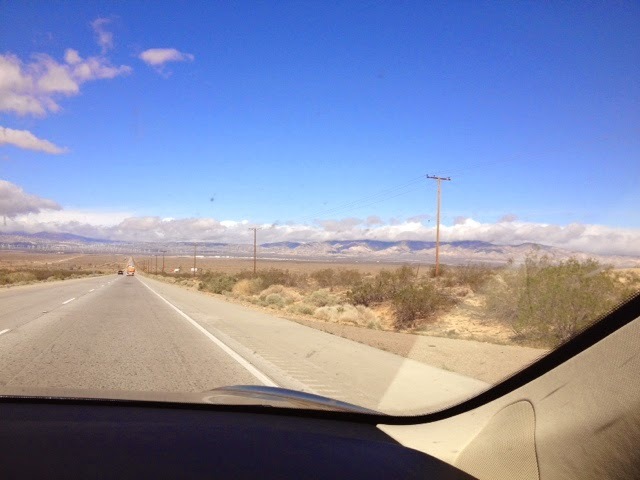 We drove through a touchless one and washed off what may have been the last salt Warp Drive ever sees. Have an A1 day! You probably can't tell, but here's Gambol in 4 states in 5 minutes. 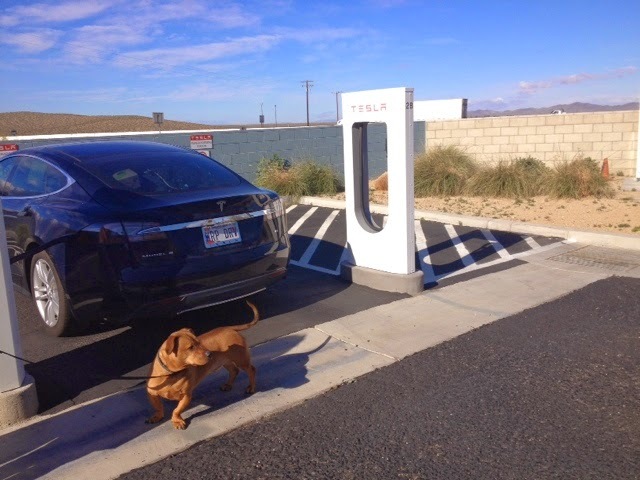 Several passerby were excited to see that Tesla charging stations seem to be "everywhere, even Blanding!" Gambol made some new friends and saw a dachshund cousin. 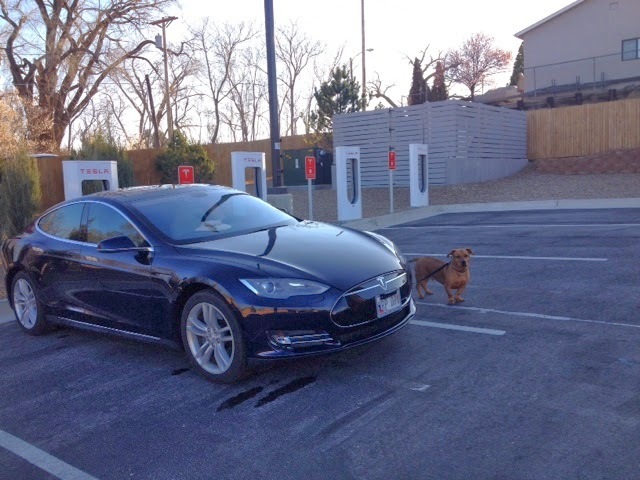 We are starting to see why the supercharger route winds around the way it does. 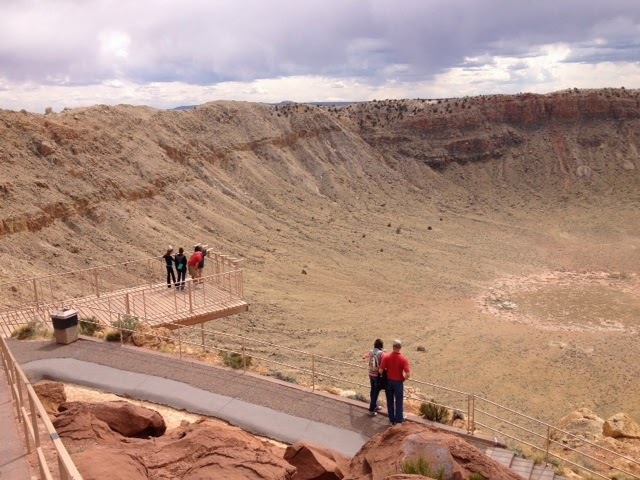 We're so glad we got to see these amazing sites! Here's just a tiny bit of the views we passed along the way. 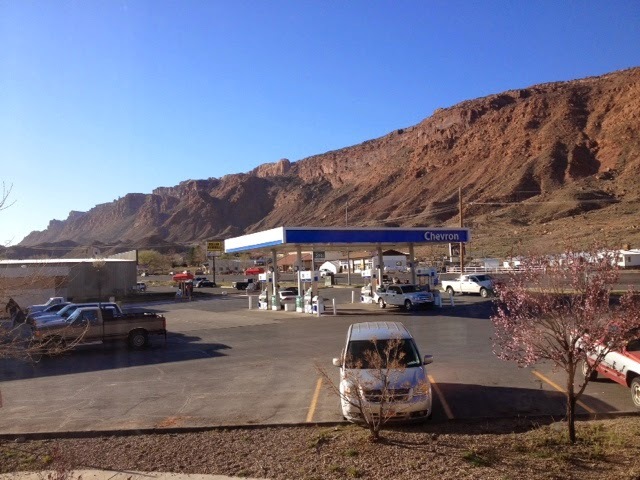 Here's the view out our hotel room window in Moab, UT. 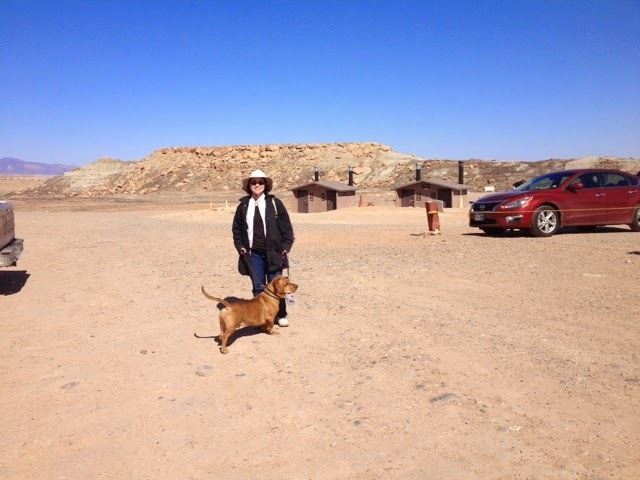 Now we're off to Arches National Park! Stopping one stop early in Moab, UT tonight. There were beautiful starry dark skies on the drive out here - not washed out by the city lights like our old town near DC. 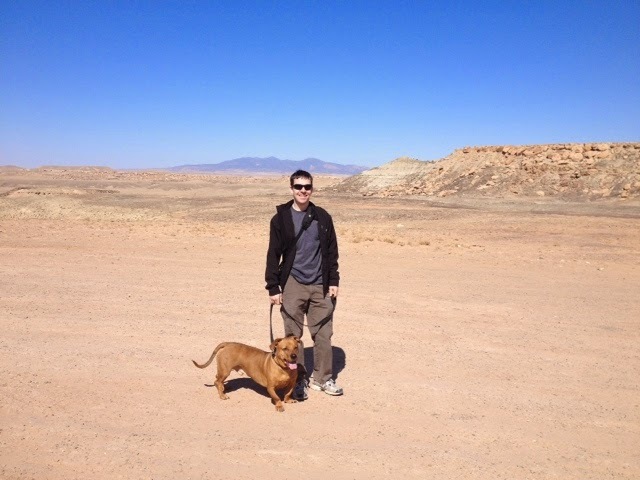 Moab is near Arches National Park, so we might stop there tomorrow before heading out. It's really warming up now - 49F, and we actually used the A/C for most of the drive today. Colorado was an amazing drive. Tomorrow we'll see four corners and visit four states at the same time! 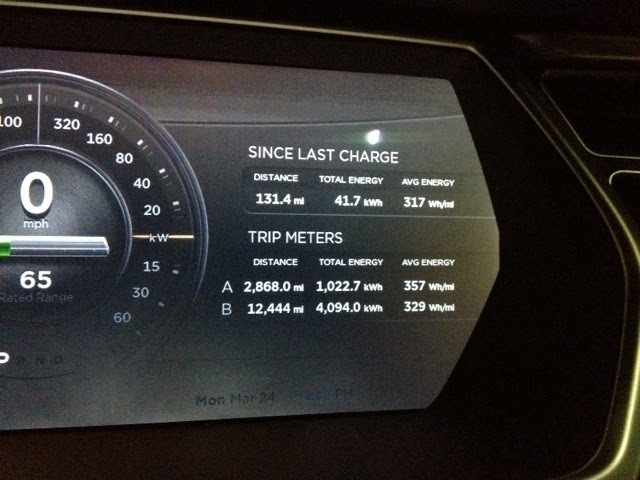 We've gone 2482 miles so far, at an average of 364 Wh/mi. 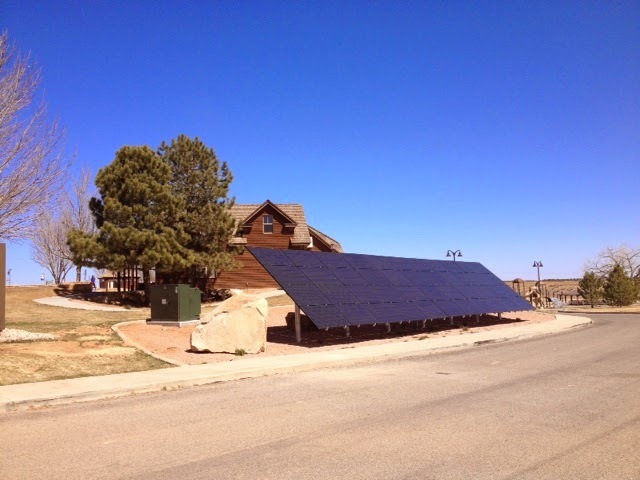 Tomorrow we'll break 1 MegaWatt-hour of energy used! 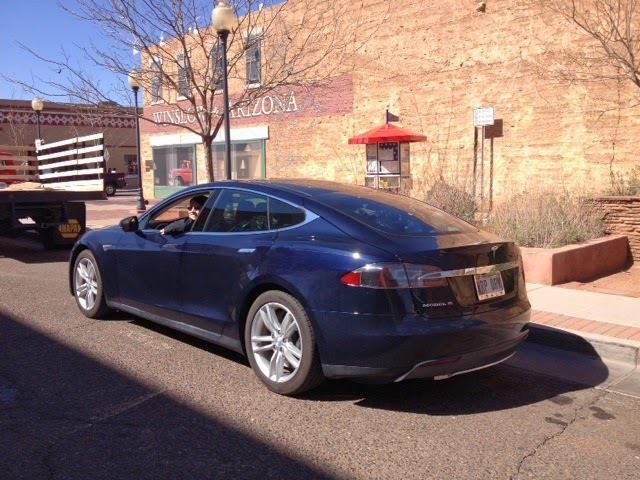 One red Model S was already charging when we arrived at Grand Junction, CO, and after they left another one pulled in! The latter was brand new, still with temp tags. We also talked to an awesome and enthusiastic Chevy Volt family that drove up. Curiously, a Mustang decided to park in one of the supercharger stalls, despite having literally hundreds of empty spots available. Driver appeared to be affected by certain recently legalized Colorado substances. Still plenty of charging spots left though! 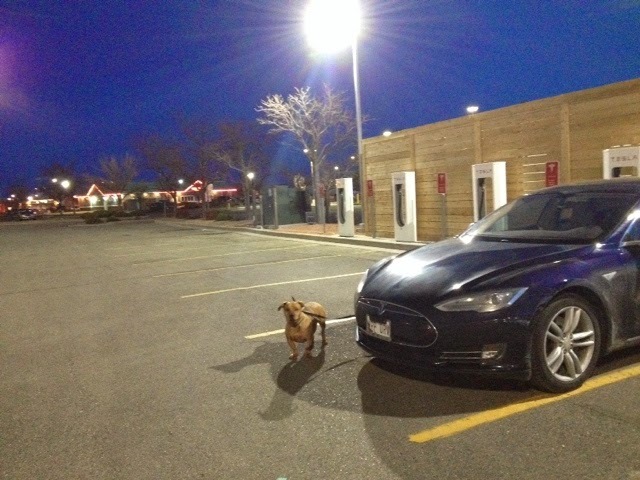 Also, we have a working theory that all superchargers are within 2-5 miles of an Outback Steakhouse. Here's one behind Gambol. Drove through the canyons into Glenwood Springs for a quick 10-minute stop. Here's a Petco behind Gambol at the supercharger. We had an amazing morning. 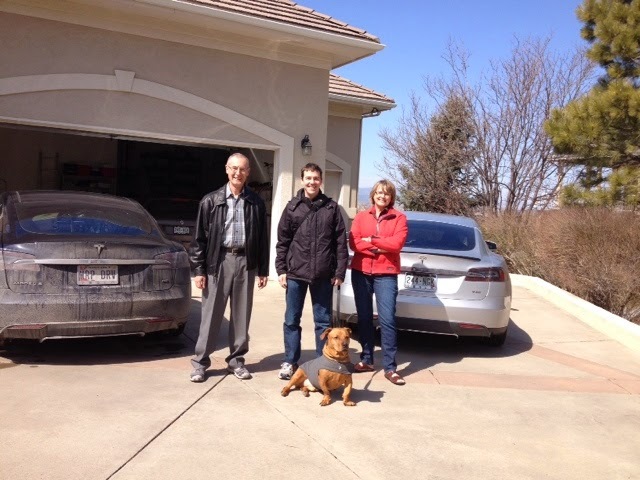 First we met fellow Tesla ambassadors Hart and Teresa, who graciously invited us for breakfast at their beautiful home. 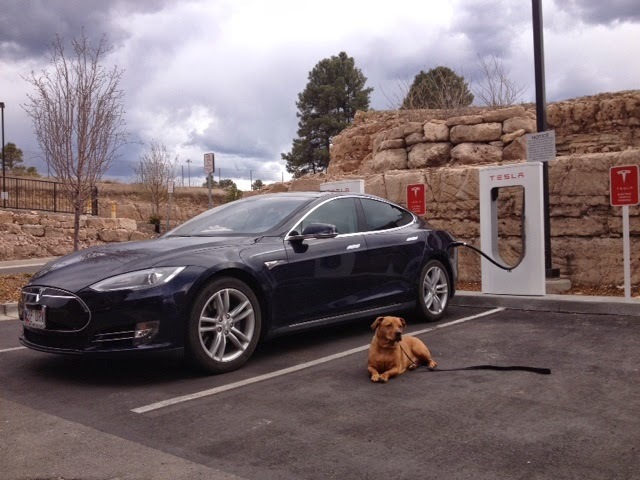 Hart is a huge Tesla fan and very knowledgable about the surrounding superchargers. 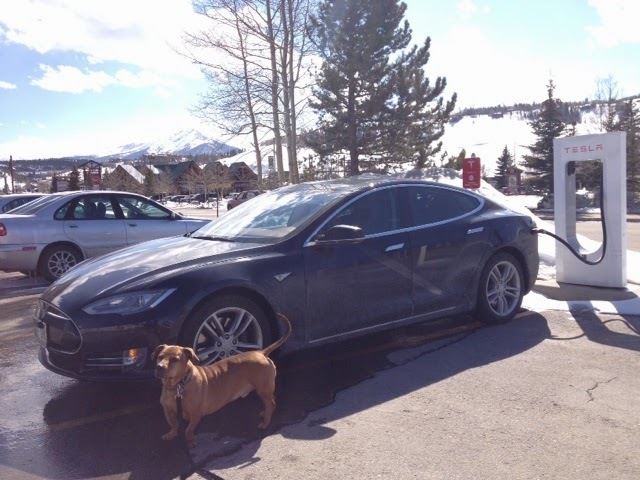 We also got to plug into his 50A charger and get some extra juice for our climb into the mountains. Hart and Teresa, thanks so much again! Here's Chris, Hart, Teresa, and Gambol. Their car is a lot cleaner than ours after the snowstorm we drove through last night! Then we visited another friend in Lafayette. 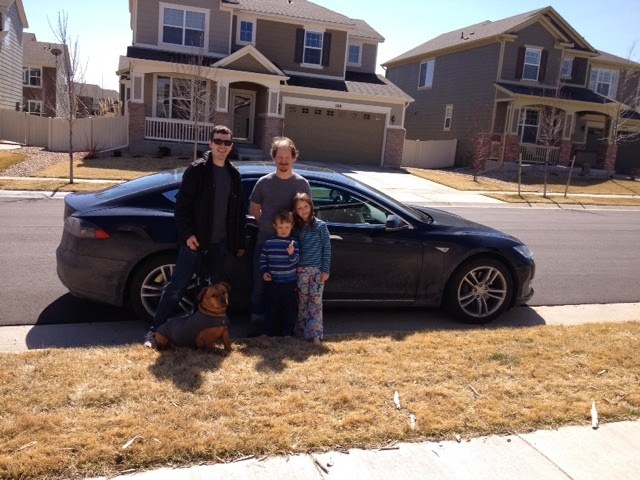 His kids loved the Tesla! Here's Dr. Matt, another of the smartest people I know. 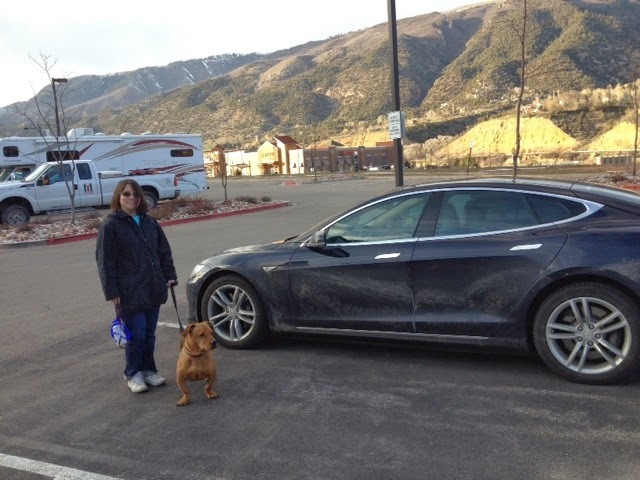 Finally we drove through the mountains into Silverthorne. It was absolutely beautiful. We climbed to 11000 feet and then drove a 7% grade for 7 miles! Other cars have to ride their brakes the whole way down, but the Tesla just regenerates power for braking. We actually gained 9 miles of range on the way down and never had to touch the brakes. Here's our energy graph at the end. Orange means we were using power, and green means we were gaining it back. 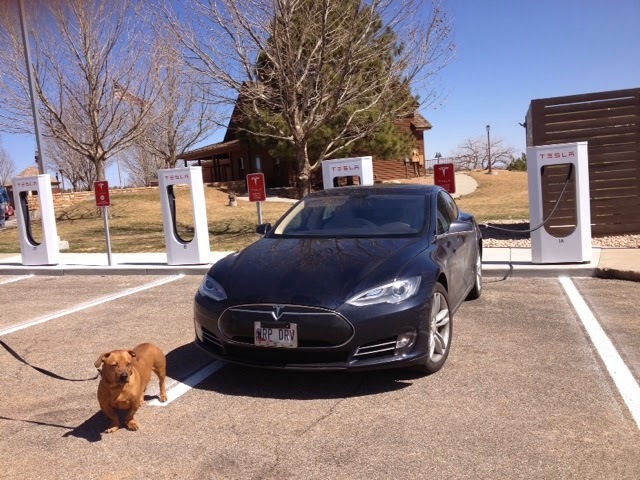 And as always, Gambol at the supercharger in this beautiful town. Looks like we've got some clearing to do this morning. This is pretty much what most of our ~500 miles looked like today. South Dakota and Wyoming have a lot of cows. The highway was a two lane road with almost no cars on it, 70/75 mph speed limit, a strange red pavement, and fields stretching as far as you can see in all directions. No houses, no people, just cows. And one crazy pheasant that tried to run right in front of us; the Tesla brakes work great! 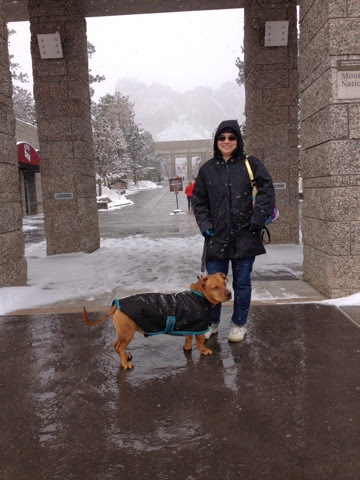 We planned to make it all the way to Boulder, but the snow storm near Rushmore really slowed us down and we were too tired by the time we reached Cheyenne, so we're staying there for the night. We reached the halfway point in our trip today. Tomorrow we will conquer Colorado! Mount Rushmore was totally worth the short detour, even though it was a little hard to see in the fog. On the way to Lusk, WY from Rushmore, we drove straight through a winter storm. The most exciting (?) part was the 7 percent grade slope for 1/4 mile on the way down the mountain in snow-covered roads, crawling along at 5mph. Down the mountain we got regenerative braking the whole way. Our energy graph has the same peaks and valleys as the mountain range. Will post pictures later. 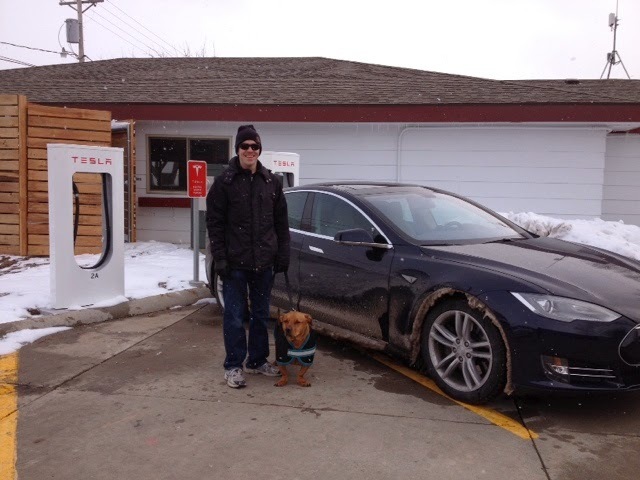 There was no cell service for almost the entire drive, which meant no Slacker internet radio in the Tesla either. We tried the radio - there is exactly one station, 99.5 "Black Hills Country". The weather forecast consisted of "chance of snow tonight, 14 degrees". 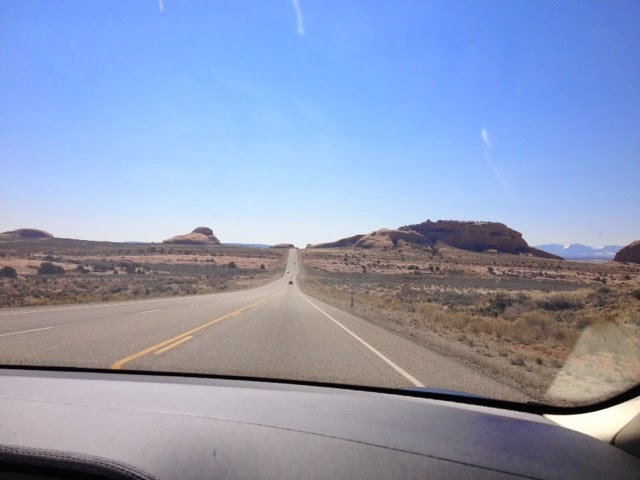 We also passed a sign for a "roadside table", which I took to mean a Mesa or some rock formation. Nope, it was literally a picnic table on the side of the road. 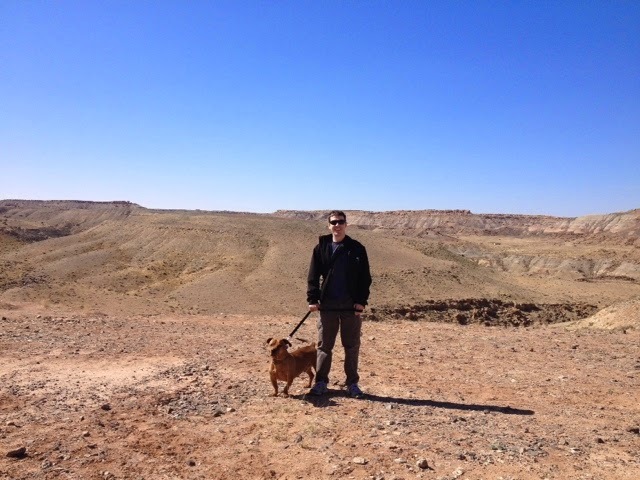 There were also herds of antelope on the drive. 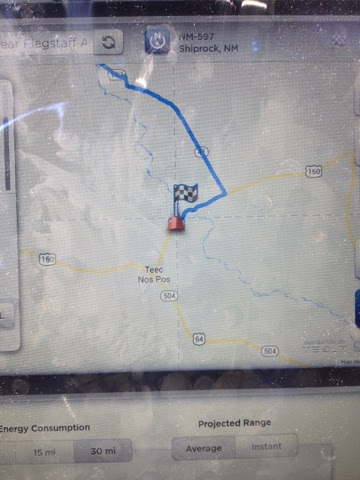 There's a Tesla service tech working on one of the stations in Lusk, WY, but the one we're plugged into is working fine. It turns out he works at the same place I'm going to in Palo Alto. I got to see some inside details of the supercharger workings, but I can't tell you. Sorry! This is Mount Rushmore behind Gambol, I promise! The journey begins on or around March 19, 2014.